It’s unusual for the main character of a book to be the bad guy, but this is the case in Eoin Colfer’s Artemis Fowl. 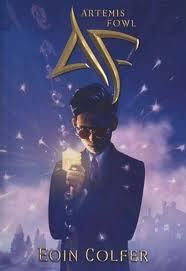 Artemis Fowl is a 12 year old criminal mastermind, who seeks to restore his family to billionaire status by stealing the sacred book of the fairy people. After decoding the fairy language, Artemis discovers the location of the fairies’s magic restoration ritual. There, under an ancient oak tree, Artemis captures Holly Short, an agent for LEPrecon (think fairy Interpol) and holds her for ransom in exchange for fairy gold. LEPrecon’s response is to send in their retrieval team. This is tricky, however, since fairies aren’t allowed to enter human dwellings without permission. In comes the unscrupulous, kleptomaniac troll, Mulch Diggums! His principles and criminal record have long since been compromised, so he’s the perfect person (ummm creature) to break the rules and dig his way into Fowl Manor. Unfortunately, the fairies underestimate both Fowl, who stays one step of ahead of them throughout the novel, and Holly, who is able to break free from her cell and finish the magic restoration ritual. Together, Holly and Butler, Artemis’s body guard and butler, defeat the troll, and the fairies are forced to give Artemis the ransom. In a last ditch effort to regain their gold (and their dignity), LEPrecon makes one last attempt at defeating Artemis, but again he outsmarts them. Luckily, even a 12 year old evil genius has a soft spot. For Artemis, it’s his mother who has been in a catatonic-like state since his father disappeared months before. Artemis returns half the gold in exchange for a wish – the return of his mother’s sanity. Holly uses her magic to grant this wish. Now, before we judge the wicked Artemis too harshly for being a thief and a kidnapper, there are several more Artemis Fowl novels and many more fairy adventures. My guess is, he gets a chance to redeem himself. I’ll have to start highlighting the naughty words so I can give an accurate count, but I don’t recall any bad words in this book. That’s not to say one or two didn’t slip past me. It’s possible some kids could find the final fight scene between the troll, Butler, and Holly a little disturbing. I’d say it’s a level or two above cartoon-level violence. It’s not enough to upset my kiddos. None. This was a welcome change after my last couple of reads full of teenage sexual angst. Magic rituals, spells, fairies, centaurs, trolls. Some parents who are squeamish about pagan culture, will not want their kiddos reading this book. How is reading a novel in which the bad guy is also sort of the hero affect your reading of the novel? Did you find yourself rooting for Artemis or the fairies? Did you find the use of spells and magic troubling? Exciting? Interesting? How is this book like other books in the spy/espionage genre? How is it different?